This outdoor scavenger hunt is a small & simple way to add a little game into your next family walk. You can have your children point out their findings to you along the way. These searchable items are most likely to be found in spring or summer seasons – depending on what the weather is like where you live. How many of these ideas do you think you could find out in your own neighborhood? Is there anything unique in your own neighborhood that you don’t think many other people have? Let us know about it in the comments below! This free printable outdoor scavenger hunt is easy enough to play that the whole family can participate. 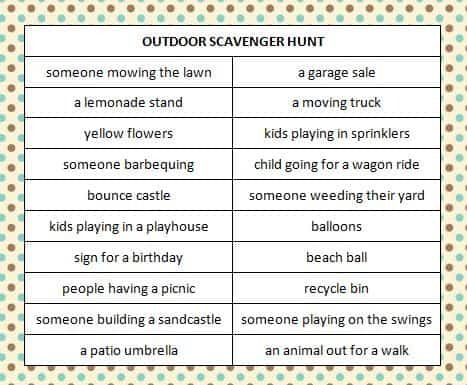 You could even have your kids make up their own outdoor scavenger hunt game by making a list of the things they want to find while they are outside. Creating your own scavenger hunt is a great rainy day activity and it gives you something to look forward to when the sun starts shining again. Looking for some more fun printable games to enjoy outdoors? Check out our free Printable Games page where we have scavenger hunt ideas for every season and a variety of different themes, plus some BINGO I Spy cards, charades, movie trivia for kids and plenty of other ideas for family fun. Did I mention that they are all free? We love requests from readers so if you are ever looking for an activity idea and you can’t find what you are searching for, please let me know and I’d be happy to help you think of ideas. We’re always adding new freebies and we don’t want you to miss out on any updates! Follow us on Facebook, Twitter, Pinterest or our new RSS feed Bloglovin’ and never miss an update! Cute idea! Summer days are long- gotta fill em up!!! What fun! That looks like a great idea. My kids still love scavenger hunts, though, they now want really cool prizes at the end. Ah… age. Anyway, I’m here to visit from the Blogger Resrouces & Opps page on facebook. What a great idea….and one I will use when babysitting the grandkids on Monday! I just stopped by from SITS to say hello; hop you find time to do the same. such a great activity! thanks for sharing! !